Andy: This rum is just ok. I’ve had worse…I’ve had better. It’s smooth, dry with not a lot of flavor. This wouldn’t be high on my list, I would buy something else. 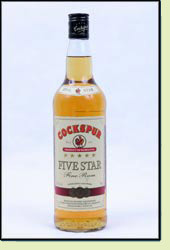 Adrian: Cockspur 5 Star has a nice flavor. You can almost taste the barrel it was aged in. Still great after mixing with Diet Coke. I could definitely drink this on a regular basis. This is the best “cheap” rum I have found in the UK.